Getting from Amman to Petra had been an amazing journey all on its own, but despite this awesome trip down the Kings Highway, by the time I arrived I was completely and undeniably ready for some Petra action. Images of the oh-so famous Treasury had invaded my thoughts and my dreams, so it was time that I finally saw it with my own two peepers! For anyone who doesn’t know, the Lost City of Petra potentially dates as far back as 312 BC, however, the Nabataean city was abandoned some 600 years AD. The existence of this rose coloured city then went undiscovered by the world for many centuries; it was not until the year 1812 that it was discovered by Swiss explorer Johann Burckhardt. Since the ‘re-discovery’ of Petra, it has been named a UNESCO World Heritage Site, is considered to be one of the New 7 Wonders of the World and has remained one of the most awe-inspiring works of ancient architecture in existence. Logistically, visiting Petra is pretty straightforward. The town of Wadi Musa is located adjacent to the Rose City, and has a tonne of different options regarding accommodation. Of course, the most luxurious and expensive options are literally located across the road from the entrance point, and the further you get from the city the cheaper stuff gets. I spent my time in Wadi Musa based at the Petra Gate Hostel. It was undeniably basic (and fricking freezing!) – but the beds were comfy, the staff were friendly and overall, it was a decent place to rest my head at night. Ticket prices to enter Jordan have recently changed, and overall are actually much cheaper if you are intending to stay in Wadi Musa for at least one night. Prices for people only visiting Petra for one day and not staying overnight within Wadi Musa can expect a much more expensive ticket! For a ‘non accommodated visitor’ a one day pass will set you back a whopping 90 Jordanian dinars – approximately $160 AUD! For an accommodated visitor a one day pass will cost 50 JD, a two day pass 55 JD and a three day pass 60 JD. Petra really does warrant at least a two day visit, and these ticket prices definitely do create an incentive to stay longer and explore more than just the main trail! Tickets can be purchased directly from the visitors centre, and this centre opens at 6am. It is however worth noting that if you have a multi day ticket already, you can actually enter the city as early as 5am – as you can bypass the visitors centre and ticket office. This early access rule is seriously important for anyone who hates crowds, is a bit of a photography enthusiast or who just wants to get that perfect shot outside the famous Treasury! On my first day exploring Petra, I rose before the sun and set out to see the Treasury that I had dreamed of seeing ever since I had seen The Last Crusade as a young kiddo. After breezing through the entry point, I power walked through the first 1km to the entrance to the Siq. The Siq is the ancient entrance point to the city of Petra. Most of this curving rock formation is natural, but some was carved by the Nabataeans. In the next photograph you can see a very obviously carved line on the right hand side – this is thought to have been how water was transported to the city! You can also see a couple of doggos in this next picture. They first approached me upon entering the site and happily stayed with me, leading me all the way to the Treasury. The best game ever – spot the doggos! At last, I had arrived; and it was even more beautiful than I had ever imagined. The Treasury is easily the most famous facade in all of the Lost City. Not only was it used to shoot the final epic scene of Indiana Jones and the Last Crusade, but it is also just downright fricking beautiful! This facade may be known as ‘The Treasury’ – but the site itself was not built for anything even remotely related to finance or treasure! When archaeologists first discovered this site, it was noted that the facade was crowned with a funerary urn – suggesting that the treasure of a pharaoh would be hidden inside – hence the name ‘The Treasury’ was given. No such treasure was ever discovered, and it has since been decided that it is more likely that this ‘treasure’ was more legend than reality. Some archaeologists also believed that this would have been where important documents were kept, however this is now considered extremely unlikely. Recent excavations have discovered a graveyard below the Treasury; making it much more likely that this was used as the final resting place for important Nabataean people. Petra is by far the most visited tourist attraction in all of Jordan and The Treasury is the most famous site within Petra, which means that if you visit during ‘normal hours’ this facade will be full of many many people milling all about the place – which just isn’t my thing at all. So, for me, the only time to visit this stunning stone structure was by the first light of day. Sure, getting up at 4.30am may have been rather brutal – especially for someone who is much more of a night owl – but it was undeniably worth it. When I first arrived at The Treasury, there was only one other soul present. A local Jordanian man was dutifully sweeping the sand, I was taking 800 photographs (no word of a lie) and you could hear nothing but my camera shutter accompanied by the wind blowing through stone gorge. I only had it alone for 20 minutes, but over the course of that first hour only a small handful of other travellers came through, meaning that my time at the Treasury was quiet, energising and honestly, downright magical. Eventually, the quiet magic had to come to an end. The local ‘bedouins’ (and I use that term loosely – we will revisit this in a future post) started to arrive with their camels and donkeys, ready to offer tourists rides (another issue I will get to in a future post) and with them, many more people started to arrive. I took a few pictures of the colourfully adorned camels, declined the offer of a ride from at least 7 people and took that as my cue to move on and continue my exploring of the Rose City of Petra. Remember: Get an early night and prepare yourself for an early start! It is beautiful; especially considering that it looks like it was all carved away from the rock face. Was there a cave originally which got them started, I wonder? But how can it have become lost? This is something I’ve always wondered about Machu Picchu. Did you not go inside? I was waiting to be disillusioned from my memory of the Indiana Jones set. Do you have a modern seven wonders list which you’re working to? I like your use of peepers. I’ve not heard that in years and was in the local newspaper archive this past week and came across an article about who “had the best peepers” and even though this was the 1990s I was in I still automatically took it for some sort of sexist article. There is a lot of odd stuff in old newspapers by modern standards. It just shows that you notice something you haven’t heard in ages, then it’s noticeably everywhere. I look forward to the rest of the adventure. No I didn’t! A local Jordanian told me that more damage and erosion has occurred in the last 20 years than in the previous hundred years – so I didn’t feel that it was right to venture in and contribute to it in any way. As always, thank you for reading and your thoughtful comments, I look forward to sharing much more of Jordan with you! Yes, this is a place where getting up early really pays off. I think I was an hour later than you but there were only six people including me. I thought that the buildings were used for feasts commemorating the dead, but maybe a guide’s fable…. I think the guide may have been having you on there! I am glad you got there nice and early too – it really does make a big difference. As always, thanks so much John – it certainly was an incredible experience! I love how you captured all the red shades of stone and sand! Alough oldervthan you I too have dreams of visiting after watching Indiana Jones. I wanted to be an archeologist. Don’t apologise at all! I love hearing your stories! How long will you be in China? I read all of your posts. This post, by far, has the best pictures. Your smile indicates that you are genuinely happy. I understand why. Thank you! The Treasury certainly is enormous! This is certainly confirmation that Petra will be worth the three-day stay I have planned, but that isn’t until 2021. Oh, well, in the meantime, I will have your series to which I may refer. Exemplary photos, as always. 2021?!?! You are certainly planning in advance! Do you have any adventures planned for between now and then? Certainly. All in the next three or so years will be in North America, unless my son & his lady decide to tie the knot, across the Pacific. Next summer, a family wedding WILL take place, in the northeast U.S. and I will visit several spots in eastern Canada, New York, Pennsylvania and the southeast U.S. The two summers following that will find me in the northwest U.S, western Canada and Alaska (2019), then central coastal California and southern Utah (2020). Wow, that’s beautiful and amazing and now I want to see it! Do it! A Jordanian adventure would be amazing! Don’t be afraid! Especially not of Jordan – it is such an amazingly safe country! Good on you for doing the Camino though – that is AMAZING! It definitely does, but apparently less so at the moment. The tourist numbers in Jordan have really dropped as of late – making now the perfect time to go! A truly magical place in my mind. He is just the best fictional archaeologist ever! I hope you do too! You are right about the people too – they are so so lovely! Thanks so much Vicki – maybe it is time you booked a Jordanian adventure? Thanks Meghan! It is certainly and amazing place! It really was – an experience I will never forget! I too loved The Last Crusade, and remember thinking how magical this building looked when I saw it! So lovely that you fulfilled your dream of visiting! Fabulous photos! Very jealous of your adventure here. This is the ONE place I really, really want to visit. Maybe next year. Do it! 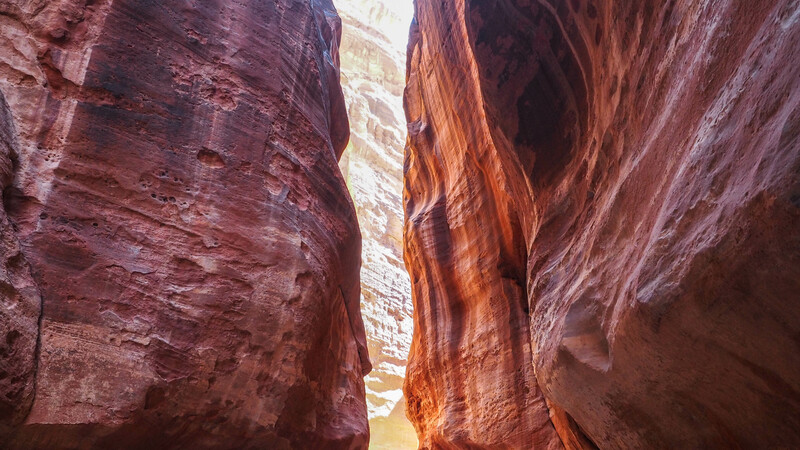 Tourist numbers are really low in Jordan right now – making it the perfect time to go! Incredible! The photos are stunning! Gosh it looks breathtaking. I love your photos and write-ups! Going there next week and wondering whether it’s possible to have my Jordan Pass stamped that early in the morning before the visitors center opens? Visited last October and like you got there as early as possible, truly magical although its nice to see later in the day, notwithstanding the crowds as the light changes as the sun moves across. We were told tourist numbers are very low at present so its hard to imagine how busy it used to get. I heard the same thing and I still thought it was busy! I am so glad I didn’t visit during a very busy tourist season! Your photos of the Treasury area are amazing. I watched that Indiana Jones movie too when I was younger, and have always wanted to see the lost city. The architecture looks decidedly Greek, so I would be quite interested to know about the early history. Anyway, I keep going back to your photos and looking at all of the details. This is so amazing. Thank you so much. <3 You have gotta go Tim! A trip to Petra would be a real highlight, I promise!